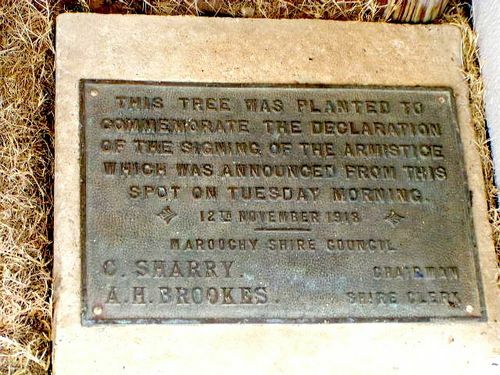 A plaque commemorates the planting of a tree which commemorated the declaration of the signing of the Armistice in 1918. The tree was planted in on the 12th November 1918 but the plaque was not unveiled until August 1921. Across Petrie Creek from Nambour, near the railway bridge, local residents may have noticed a very appropriate memorial steadily taking shape, a memorial which nature will doubtless do much to give further shape to. On the ridge from which the Armistice was announced, first there appeared a picket fence enclosure, then a fig tree was observed to have been planted, and it grew well for months: so did the weeds, but by and bye these were cleaned out and a little pruning done. Then the fence took upon itself a coat of paint, and again another, so that it is now conspicuous in its whiteness. This week a bronze tablet appeared upon the side facing the road, bearing the words: This tree was planted to commemorate the declaration of the signing of the Armistice, which was announced from this spot on Tuesday morning, 12th November 18. Maroochy Shire Council, C. Sharry. Chairman, A. H. Brookes. Shire Clerk. Chronicle and North Coast Advertiser (Qld), 26 August 1921.